The Easter Lily is the symbol of a ceremonial which is older than history. It illustrates a story as old as humanity-one which tells of feasts to the Great Spirit in gratitude for the return of spring or for a bountiful harvest. Unlike other primitive observances which have become obsolete, or more recent forms of thanksgiving which have no relation to the past, the Easter festival has been handed down through the ages, replete with religious significance to almost every race of mankind. 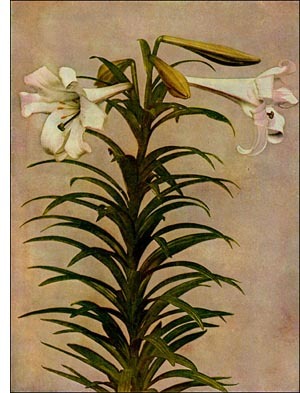 In 1875 a beautiful form of the lily family was brought by a woman to Philadelphia, from Bermuda. This lily (Lilium longiflorum) at once obtained great popularity by reason of its unusual size, the large number of flowers on each stem, and their extraordinary beauty and purity. The imported plants were soon bought by Mr. W. K. Harris, of Philadelphia, who named it the Lilium harrisii, but at the present time it is known as the Lilium longiflorum, variety eximum. The great beauty of the flowers, the fact that the plants mature early in the sason, and their ability to endure a high temperature, allowing them to be forced to bloom during the winter, all combined to make this lily the universal choice for the typical Easter flower, which position it still worthily maintains, as though conscious of the deep significance of the festival of which it is the chosen floral emblem.